Beer fans from all over the country are flocking to Toppling Goliath Brewing Co. in Decorah, a new darling of the craft beer world. 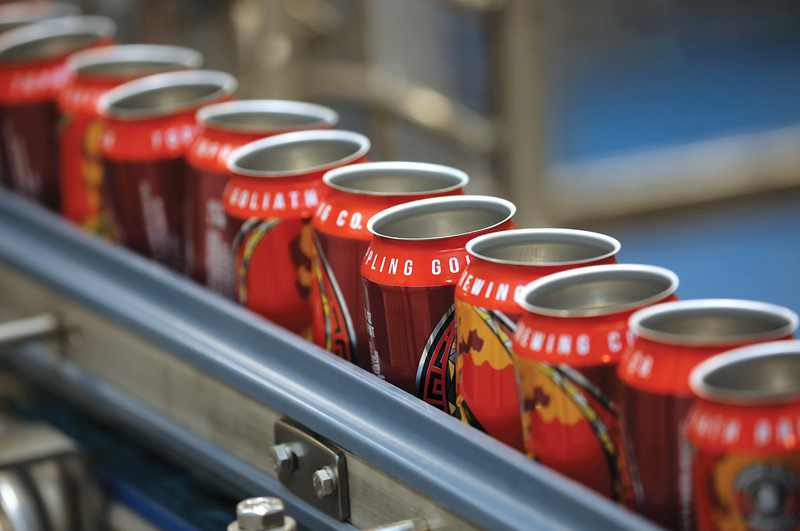 Above: Pompeii IPA is canned in the brewing and packaging facility at Toppling Goliath Brewing Co. in Decorah. A perfect pour of Rover Truck Oatmeal Stout. Decorah always has held the quaint draw of a college community, the dramatic landscape, the trout fishing, the Norwegian heritage, the Whippy Dip’s ice cream, the popular bald eagles that nested there. Yet city and park officials knew the town of 8,000 people had even more to offer and sought out what might add to its appeal, including the years-long work to open the Trout Run Trail in 2012. For all of that planning and effort, though, it turns out it was something much simpler, something they hadn’t planned, that got people to flock to Decorah: Beer. More precisely, beer from Toppling Goliath Brewing Co., which since launching in 2009 has rocketed from a home brewer’s dream into a national phenomenon. 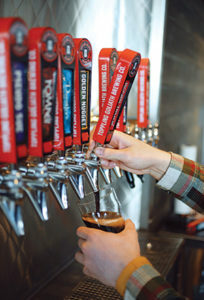 The unexpected tourist attraction now looms large—both metaphorically and physically—over the northeastern Iowa city with award-winning beers crafted at its new taproom and 35,000-barrel production facility in an industrial park atop a hill on the southern edge of town. Bartender Nick Cardona pours a beer at Toppling Goliath Brewing Co.
Beer lovers travel the hilly roads in search of brews that have been celebrated by websites as some of the best in the United States—and the world. They crash computer servers trying to sign up for a lottery to win the privilege of paying $100 for two bottles of a limited-release beer, or they spend more than $1,000 a bottle on secondary market websites. They camp overnight and wait for hours for a chance to come into the brewery for special releases that might not even be available when they get through the door. 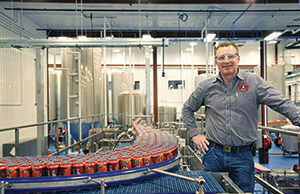 Owner Clark Lewey oversees the canning of Pompeii IPA in the brewing and packaging facility. CREATING A HYPE THAT MAKES BEER GEEKS behave like tween girls screaming for their favorite boy band wasn’t really what Clark Lewey had in mind when he launched Toppling Goliath. He was just tired of driving to Rochester, Minnesota, or La Crosse, Wisconsin, to find his favorite beers. Then in 2008, Lewey’s wife, Barbara, gave him a beer-making kit for Christmas. 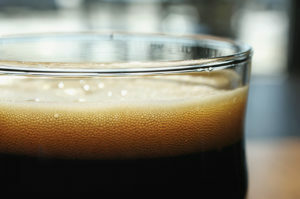 Immediately, Lewey went big and bold, taking what was supposed to be a simple amber lager recipe and making it hoppier. It didn’t go well. He scorched the stove and was banned from the kitchen. But he persisted and soon was sharing his hoppy brew with friends and people he met in the beverage industry from his time as a merchandising equipment supplier. When he developed an easy-drinking beer that pleased people who weren’t hopheads, he knew he had landed on a business opportunity and moved quickly to capitalize. Toppling Goliath brewmaster Mike Saboe inspects the machinery inside the brewery’s new facility. “I was possessed,” says the personable Lewey, whose friendliness can’t mask the focus, energy and enthusiasm that are the hallmarks of an entrepreneur. Within a year his hobby became a business plan and that business plan became a 1,200-square-foot brewery and taproom that soon ran out of its own beer on a regular basis. The spot near Luther College couldn’t have been more Iowan—across from a Casey’s and up the street from a Pizza Ranch. Soon after, Mike Saboe, a recent University of Iowa pharmacy graduate, wandered into the taproom to talk beer. 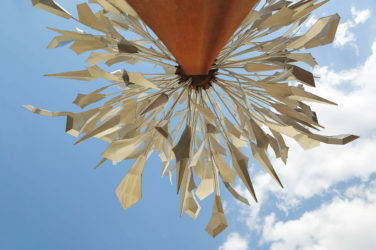 Saboe had caught the beer-making bug as an exchange student in Germany, where teenagers regularly drank beer and where he was able to try new styles and varieties. “When I got back I wasn’t old enough to buy beer, but I was old enough to buy the ingredients to make beer,” says Saboe, now 32. 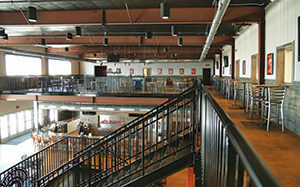 The industrial-style taproom features two levels, with ample space to accommodate large events. He and Lewey hit it off. Lewey quickly handed over the brewing reins to Saboe and gave him the green light to create beers that fully featured the hops he would find all over the world, acquired through commodity markets like other agricultural products. Though the brewery began with the easy-drinking, customer-friendly Dorothy’s New World Lager, Lewey and Saboe knew their strong IPAs and pale ales would differentiate Toppling Goliath in the beer market. First, there was a pale ale—lightly colored, strong-flavored—called Tsunami, then another called PseudoSue that gained attention. An IPA—stronger and sometimes bitter—called Golden Nugget picked up buzz too, thanks to word of mouth and favorable reviews throughout the online beer community. 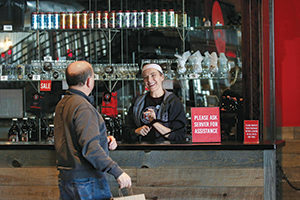 A visitor makes a purchase at the Decorah facility, where a variety of Toppling Goliath apparel, glassware, posters and related beer gear are for sale. WHILE TOPPLING GOLIATH’S DISTRIBUTION was limited—at first only in Iowa and Wisconsin—the brewery gained attention fast on popular beer websites such as RateBeer and BeerAdvocate. Spreading his creative wings, Saboe began to experiment, and Toppling Goliath’s limited-release beers only fed the frenzy. When BeerAdvocate named the brewery’s Kentucky Brunch Brand Stout the best beer in the world in 2015, and RateBeer named Toppling Goliath the second-best brewery in the world, Decorah became a destination for emerging beer tourism. Those who couldn’t get to Decorah would search online beer forums for Toppling Goliath truck sightings, then follow them around to get their hands on whatever was being delivered. 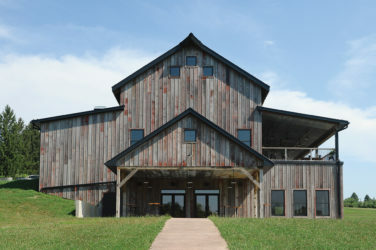 To keep up with demand, Toppling Goliath moved production beyond the taproom’s half-barrel brewhouse into a 10-barrel facility in 2010, then built a 30-barrel operation in 2013. The company outsourced some of its production, creating a partnership with Florida-based Brew Hub to brew its four signature beers, and using another contract brewer in Wisconsin. But still it wasn’t enough. Enter the shiny new brewery on the hill. Brewing began at the $15 million facility in late 2017. The taproom that opened in February features an open but outdoorsy feel that tips its hat to the beyond-beer passions of its owner—the staff gets a paid holiday to go morel mushroom hunting—and a production facility that shines with stainless steel. The two-level taproom can hold 700 people, which allows for more events than the previous space could handle. Beer fans can book a tour, and ambitious plans are underway for a restaurant to match the caliber of the beers. The facility is built for growth. It was designed to expand production to 100,000 barrels, part of Lewey’s 10-year plan. Toppling Goliath is still brewing some of its beers in Wisconsin, but soon every drop will be made at the new Decorah facility. “We are here for the long haul,” Lewey says. 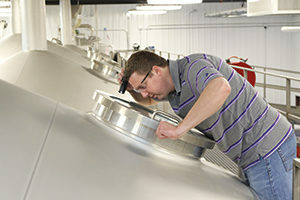 LEWEY’S PRIDE AND JOY is a top-of-the-line Steinecker brewhouse—the equipment to produce beer, not a building—he calls a “true Rolls-Royce.” Crews from seven states and four countries worked on the German-engineered machinery. The new facility also includes a laboratory with two technicians, and a canning line that churns out 250 cans a minute. Staff size ballooned to 49 by spring 2018, with more hires planned. Being a regional brewery that could get some national attention was always a goal for Lewey, even when he was experimenting with small batches in the original taproom. Not everyone liked the growth. It’s human nature. No one likes to see a thing they love suddenly belong to the world. WHAT WINS OVER THE LOCALS is what Toppling Goliath’s success has done for the community. The brewery staff asked local retailers to research local impact on a beer release weekend, and estimated the result at $1 million. That number includes brewery sales plus the 2,000 visitors to the town of 8,000 spending $150,000 in restaurants and $265,000 on lodging, as well as clearing out local grocery stores of all the craft beer. Other new breweries are flourishing, too. Pulpit Rock, not far from the original Toppling Goliath taproom, opened in 2015. Pivo Brewery in nearby Calmar opened last year. And a new business popped up to cater to them all: a shuttle service called Bru Hop. Things haven’t really settled down for Toppling Goliath, and probably never will. That’s OK with Lewey. Distribution of Toppling Goliath beer will continue to grow, with a goal of being available in all 50 states (it’s currently for sale in 12). The brewery will soon begin making sour beers, which are gaining in popularity, at a yet-to-be built site in Decorah, and Lewey wants to open a taproom on the West Coast. His plan to have a national presence seems to be coming to fruition. Toppling Goliath’s new taproom opened early in 2018 at 1600 Prosperity Road in Decorah. For more information on the beer, the taproom, merchandise and more, go to tgbrews.com. Toppling Goliath has brewed dozens of varieties of beer since it was founded in 2009. Here’s a sample of some of its labels. Dorothy’s New World Lager: Though the brewing company is known for its strong, hoppy beers, its first beer was a crowd-pleasing, easy-drinking lager named for Lewey’s grandmother. Assassin: Lewey and Saboe were in the brewery wondering what to name the imperial stout they were making. Golden Nugget: A customer named Bryan stopped by the original taproom and dropped off some hops for the brewery to try. It was a Nugget variety, known for its bitterness. “So we called it Bryan’s Golden Nugget,” Lewey says. 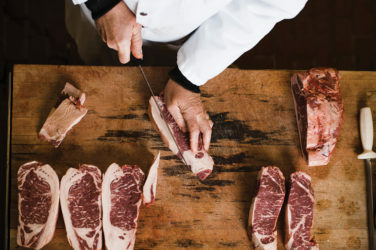 “We called him and said he should come try it because it was pretty good. He walked in and saw it on the board and said, ‘You even named it after me!’ and I said, ‘Yeah, but if it ever goes anywhere, we’re going to have to drop the Bryan.’ He was OK with that.” Golden Nugget, an IPA, is now one of Toppling Goliath’s signature beers. Scorpius Morchella: A double IPA named for (but not made with) the morel mushrooms that are a passion of Lewey and others on the brewery staff. Saboe first created the beer just for the staff to drink at its annual spring day off taken to hunt for mushrooms, which includes a feast of morel dishes.